The island called Phuket is surrounded by dozens of little islands and this archipelago is large and beautiful. Much of it is national park area and is a diver’s paradise. Here we list our top picks of small islands around Phuket, primarily for day trips. We are listing them alphabetically and leaving of ‘Koh’ at the beginning of the name, which means island. As usual, there is a helpful map at the bottom of this blog. 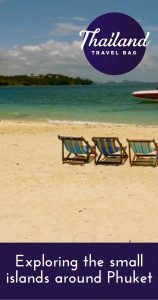 Koh Bon is a beautiful little island that is quick and easy to reach, and so is perfect to take a boat for a day or half day of sunbathing and swimming. Koh Bon is only a 15-minute boat ride from the Phuket area called Rawai. The white sandy beaches and clear turquoise waters, make Koh Bon and an ideal spot for swimming and snorkeling. There is a lovely little beachside restaurant called ‘Bon’ here, which is the only commercial enterprise currently open on Koh Bon. This restaurant is a simple place but world famous for existing on a deserted island paradise. Koh Maphrao or Coconut Island is only a 600m boat ride from the Laem Hin Pier area of Phuket. It is a small, unspoiled island, with mangrove forests and palm-fringed sandy beaches. It currently has only two resorts built on it and a small local population. Between Phuket and Koh Maphrao are floating restaurants, which are worth a lunchtime visit. If you don’t want to stay at the resorts here, it is perfect for a full day or half day trip away from the main island of Phuket. Coconut Island is also great for kayaking, especially around the mangroves. Koh Hae is well known for its coral reef so it is often referred to as Coral island. In addition to the excellent reefs, there are two beaches here called Long Beach and Banana Beach and also some hotels, restaurants and watersports companies. Boats leave from Rawai and Chalong. Koh Hae can be reached by speedboat in around 15 minutes. This island gets busy during the day with day trippers, but it is still a lovely place to visit. Since it is close the main island of Phuket, it is perfect for a day trip, or you could consider staying at one of the resorts. Koh Dok Mai is a little limestone outcrop located just over 1 hours boat ride east of Phuket. In Thai its name means “Flower Island” and it gets this name from the stunning “flowers/coral” that lie beneath the surface of the water. Koh Dok Mai is a well-known dive site since it has one of the best wall dives in the area. Koh Khai Nok is a very pretty island off the east coast of Phuket. It is has a pristine white sandy beach and is surrounded by a shallow reef which is ideal for snorkeling, even for kids. The water is very clear here and wonderful to photograph. Koh Khai Nok is uninhabited and only used for day trips, however, there is a restaurant on the island. It only takes around 15 minutes by speedboat to get to the island or 30 minutes in a longtail boat. It is a great place for relaxing on the beach, swimming and snorkeling. Again, it can get busy with day trippers so you could arrange for a private boat to take you there early to miss the crowds. 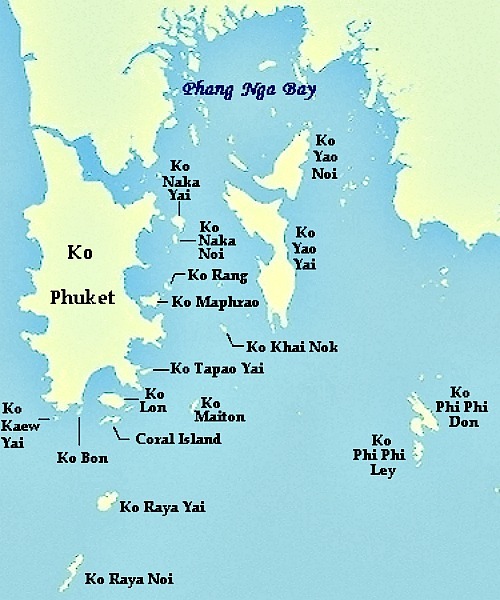 There are two Khaeo Islands one big/yai and one small/noi. At Koh Kaeo Yai you can see a replica of Buddha’s holy footprint on the beach and also a large and very beautifully situated Buddha statue, that looks back towards Phuket. The Koh Kaeo islands are a few hundred metres offshore from Phuket and are a great spot for snorkeling and kayaking. These two islands can be seen from Promthep Cape viewpoint on Phuket. This large, mountainous island is only 20 minutes by boat from Chalong Bay, in the south of Phuket but is very secluded and undeveloped. There are lots of Thai inhabitants here who make their living from fishing, rubber, and coconuts. If you are after some serious relaxing a visit to the island is an ideal way to do that. The best place for relaxing is the island’s northwest tip where a couple of tranquil resorts offer bathrooms and food. Koh Lohn is also great for trekking along the interior trails or along its beaches at low tide. Mai Ton is one of the most beautiful small islands around Phuket. This tiny island off Phuket’s southeast coast has fine white beaches and crystal clear water; ideal for swimming, diving, snorkeling, diving or fishing. There are only two resorts here, is the 5 star Mai Ton Island Resort and the Honeymoon Island hotel. 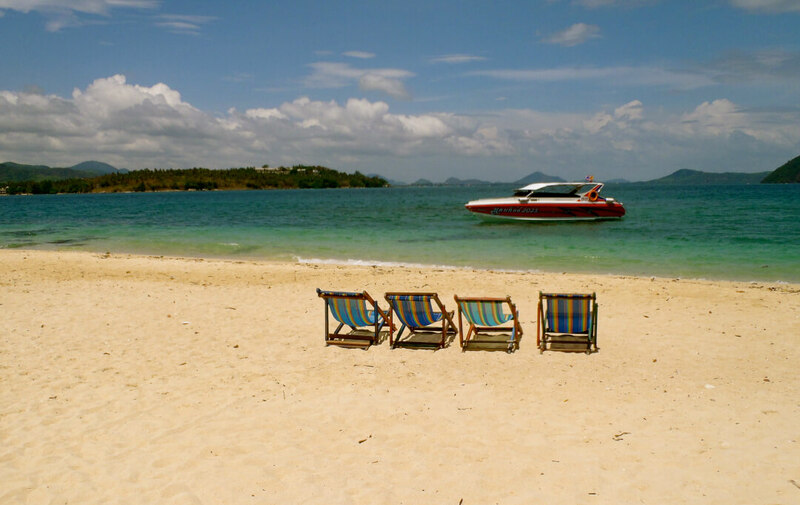 Koh Mai Ton, is 9 km from Phuket and is perfect for lazing around in the sun for the day. You can take a boat from Ao Makham Port in Phuket. There are two Koh Racha’s – one big/yai and one small/noi. Koh Racha Yai and Noi are a 35-minute speedboat ride from Chalong Bay in Phuket. Those with a passion for diving should have the Racha Islands on their list of dive sites for sure. Both islands have wonderful clear water, snorkeling opportunities, and perfect white sand. It can get busy with dive boats so if you want some peace, arrive earlier in the morning. Ko Racha Noi has an area of 3.06 square kilometres (1.18 sq mi) and Ko Racha Yai has an area of 4.5 square kilometres (1.7 sq mi). There is a luxury 5 star on Koh Racha call The Racha. There are two Koh Rang’s – one big/yai and one small/noi. Koh Rang Yai is a peaceful island lying about 5 km off the east coast of Phuket and is covered in rainforest. Its western side has a 1 km long beach with fine white sand. The shady, tree-lined interior has several paths along which you can walk around. It is perfect for a day trip when relaxing is what you have in mind. There are a variety of activities to do such as kayaking, windsurfing, mountain biking, mini-golf and volleyball. 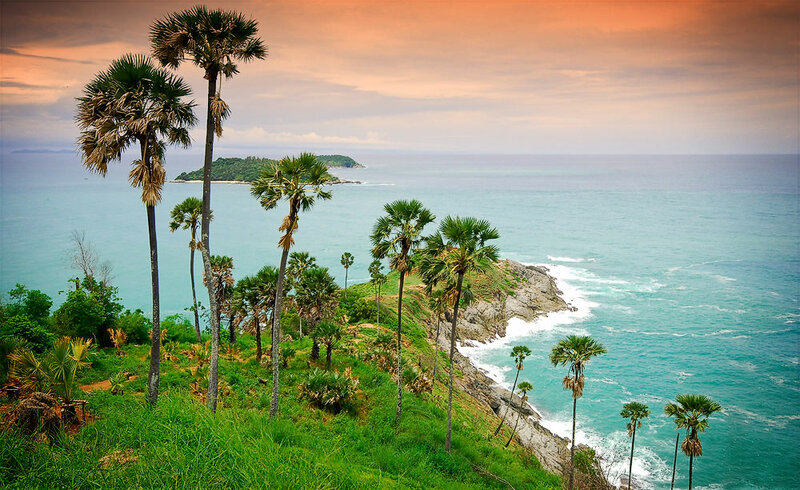 Separated from the mainland of Phuket by a shallow mangrove swamp, this island is connected by a causeway to the east side of Phuket City, and so feels more like a cape than an island. In fact, because you can walk/drive here a lot of people don’t realise they have left the mainland. This is a quiet backwater with little development and a string of coarse sand beaches. While the beaches here are not perfect, they make up for it with tranquillity. There is just a single hotel on this island, the luxurious Westin Siray Resort. It has its own beach and a small headland to give it elevation and has great sunset views over nearby Phuket City. That’s our top picks of the small islands around Phuket. We hope you enjoyed it and can use it to pick your trips out on the Andaman sea. Here is a map to help you locate your paradise tropical island near to Phuket.